The thorny problem of the Irish border could yet scupper a Brexit deal, EU negotiator Michel Barnier warned after talks with his British counterpart Friday, saying "urgent" work was needed to find a solution. Avoiding a hard border between European Union member Ireland and the British province of Northern Ireland after Britain leaves the EU's single market has become a major obstacle to finding a deal. 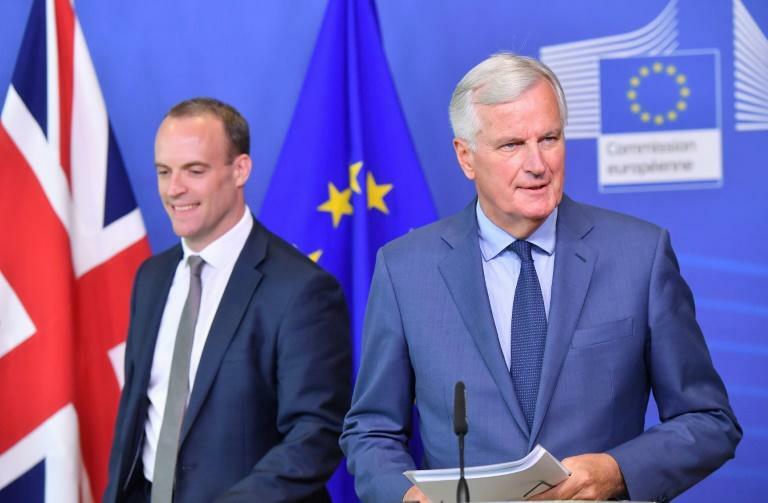 After meeting British Brexit minister Dominic Raab in Brussels, Barnier hailed progress on some security issues but warned there were still major differences over protected geographical indicators like champagne and stilton -- and Ireland. "There is an urgent need to work on the text of a operational backstop and that's why I've asked Dominic and his team to provide us with the necessary data for technical work, which we need now, on the nature, location and methods of the checks that will be needed," Barnier said. "This backstop is critical to conclude these negotiations because without a backstop there is no agreement." Raab, whose predecessor David Davis resigned in July over differences with Prime Minister Theresa May's negotiating strategy, said he was "stubbornly optimistic" that a deal could be reached. "All in all I think the contours of an agreement and a deal on the withdrawal agreement are becoming clearer and clearer, which is a positive," he said. "The solutions (on Ireland) must be workable. They've got to be workable for communities in Northern Ireland and living in the Republic of Ireland, the people affected in their daily lives by what Michel and I are negotiating on behalf of the EU and the UK." France's Europe Minister cast doubt on May's blueprint for future trade ties on Friday, warning the current proposal was "not possible". Nathalie Loiseau said May's plan unveiled in July, which envisages the UK leaving the EU's single market but staying in a free trade area for goods through a customs deal and common rulebook, is unattainable.